Kromtek can bring you customer-tailored CCTV, CATV, MATV, SMATV, IRS, Digital Headend and IPTV turnkey solutions that have proven successful with a wide range of customers throughout the global satellite television market. Our highly trained and experience installation and network support teams are on-hand to offer their full support throughout the installation and thereafter. We are confident that we have the experience, expertise and knowledge to provide you with a professional and tailored service. Kromtek’s True Digital Headend (TDH) is a complete solution for digital distribution of Satellite TV for Cable operators, Hospitals, Residential Campuses, Residential Townships, University classrooms, prisons etc. This digital headend supports High Definition (HD) and can distribute Video, Audio and Data along the same network in a secure manner. We help you to increase the channel offering across your network without loss in quality. Its flexible and modular design helps to customize the solution to your business need. Whether it is a new Headend or an upgrade to your existing Headend, Kromtek has the technology and the professionals who can tackle the task at hand. Kromtek’s True Digital Headend (TDH) is a highly scalable and cost-effective system for deploying multiple services via both set-top-boxes (Interface Units - IU) and HPNA modems over the same coaxial cable/hybrid fibre-coaxial network. The TDH includes products for content acquisition, signal processing functions and digital backbone transmission. It consists of a full range of digital functions with user friendly, simple control and management tools. 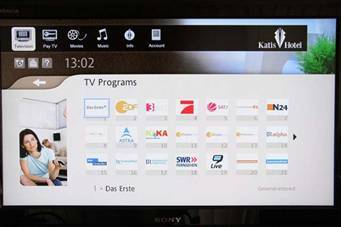 The modular system supports newer services and technologies such as Mpeg­4 and HDTV. The content acquisition portion of the TDH is capable of receiving digital video with the capability to receive Mpeg­2 or Mpeg­4 encrypted video on standard or HDTV format. Blankom’s multi.TV is the answer for delivering various media services to the subscriber by using the capacities of the Internet Protocol (IP). This turnkey-system is especially designed to stream digital-TV (DVB, ASI & A/V signals), Radio and Video on Demand via new or existing coaxial or IP networks. Blankom’s multi.TV completely supports SD & HD. Continue watching this space for more technologies that we introduce to the Indian Market. Do you have plans of Satellite TV distribution in your business? If so, contact us to know more about all the features of TDH, for upgrading your current system or for installing TDH in your area of business.